The first CECA Rail Conference took place at a sunny Emirates Old Trafford Cricket Ground in Manchester on Thursday 14 June. 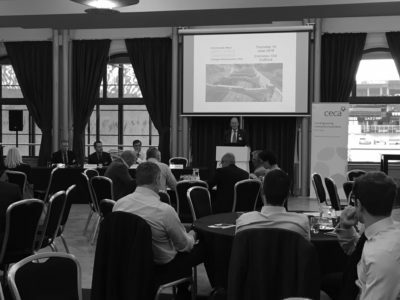 The event is one of four sector specific conferences that will be run by CECA over the coming year and was intended to provide an update on some of the key activities and trends going on in the rail sector. The conference was kicked off by Stuart Pountney, Commercial Director, IP Northern Programmes Network Rail. Stuart provided an update on Network Rail’s plans for Control Period 6, including an overview of their operating model and approach to procurement. In particular, he highlighted Network Rail’s commitment to sustainability and diversity, with a target of 30 per cent of the workforce being female by 2020, and one apprentice per £3 million of activity. He was followed by Shane Fitzpatrick, Senior Head of Service at Merseytravel. Mr Fitzpatrick offered a view of the key rail interventions expected in and around Liverpool in the coming year, including plans to overhaul Liverpool Central Station, the second busiest in the North West. Martin Lax from Transport for Greater Manchester spoke about the city’s plans to prepare for HS2, as well as the proposed Northern Powerhouse Rail and Metrolink extensions. Thom Evans of the Department for Transport offered a briefing on the Rail Network Enhancements Pipeline, explaining the way that the UK Government would now progress major schemes to enhance the national rail network, while Mr Evan’s colleague George Chilcott highlighted how the private sector could play a part in these enhancements through so-called Market-led Proposals. The day was closed out by Guy Lavis, who provided an update on Network Rail’s Digital Railway proposals, and the opportunities they create for civil engineering firms. The slides from the day are available in the members’ area.